More of the same on the Susquehanna. The fish are just not there and we are seeing more and more larger fish showing signs of the infection. Amazing how these fish are still looking for food, despite their appearance. Only time will tell how much damage the river has suffered, but of right now, things are not looking good. Honestly, there is not much going on fishing wise right now for us, but we have been very very busy working behind the scenes gathering support for the Lehigh. We are talking about support on all levels, from the state on up through the federal. Momentum is mounting as more and more anglers are taking interest in the potential this fishery has. Really, there is nothing like it on the east coast. Then add in all the cold water tribs and you have something very special. On top of all this....is the recent formation of the Lehigh Coldwater Fishery Alliance. This alliance is the product of concerned anglers whose goal is to obtain a consistent release of coldwater (55 Deg F) from the Francis E Walter Reservoir (FEW) through better utilization of FEW's storage capacity and discharge options, in an effort to improve overall flows, protect habitat and enhance the Lehigh River's wild trout fishery. Most of the state is about normal for this time of year...but there are definitely some areas which sorely need the rain. For instance NE PA could use a good dose. Hopefully, we will get some in the coming days along with a nice shot of cooler air. Doubt it will last too long though, as we are in the heart of summer right now. There will definitely be more to report about this group in the coming weeks and months as it is just now getting off the ground. Once again, if you would like to lend support to the Lehigh River - please email us! Otherwise, we have pretty much decided to scrap fishing the Susquehanna this year. Yea, there might be a white fly trip or two, but that will be pretty much it. As most know, the Susquehanna is in the midst of a pretty significant outbreak of bacterial disease. The PFBC does not seem to be that concerned, but what this situation does indicate is a river system being stressed to the point of being pushed over the edge. Most of the time our aquatic friends can be compared to a 'canary in a coal mine.' And in this instance it is much too true. Read more about the situation here. And just think ~ it was the snakehead which made the made the front page of the Inquirer here in Philly a while back! In your mind...which is more serious to our waters and fisheries?! Bottom line is...we need some cooler weather! Rain would help to, but that might be what pushed the 'hanna over the edge in the first place. If I did not know better, I would say the equator has moved north, and now straddles PA! It is that bad outside! If you can't get on the water extremely early, it ain't really worth it. Thank god for those early am hatches like the trikes. Which are now hatching and providing consistant, allbeit at times, frustrating action. As for the Susquehanna - it remains in a funk! 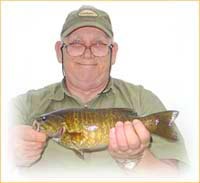 Overall the fishing is slow, with a good day being just a few fish to the boat. It really seems as if the fish are just not there. With the white fly hatch right around the corner, it will be interesting to see what the river shows us. BIG THINGS ARE ON THE HORIZON FOR THE DOWNSTREAM LEHIGH RIVER FISHERY!! Tropical Rainstorm Cindy definitely spread her love over eastern PA - with the I-95 corridor coming out on top. The whole state did do OK though - rain wise - from this most recent tropical attack. SUPPORT IS NEEDED FOR THE LEHIGH! PLEASE EMAIL US YOUR NAME, ADDRESS, EMAIL ADDY AND YOU'LL BE ADDED TO OUR LIST OF LEHIGH REGULARS! Fly Fish PA, PA TU and LRSA were all in attendance Wednesday - for the Road Opening Ceremony. 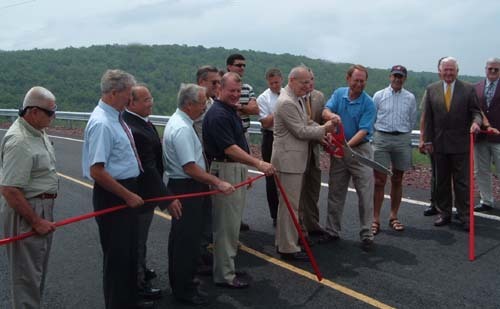 This event celebrated the newly constructed road across the breast of the Francis E Walter dam. The event was hosted by the Army Corps Philly District and was attended by quite a few dignitaries from throughout the FEW area. Finally after 44 years the Corps does not need to evacuate water from FEW to keep the 'lower dam road' open. In the past, prior to this year, any lake elevation above 1,309' would inundate the 'lower lake road,' forcing it to close. This was one of the reasons water could never be stored for extended periods of time as well as for recreational purposes. That was all to change this year, but due to an extended dry period, very little water has been able to be captured. 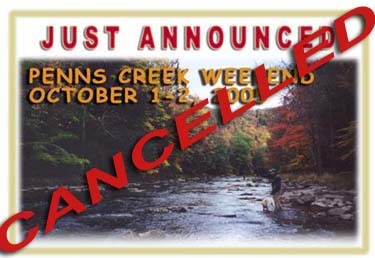 Coldwater has not been able to set-up, and whitewater releases have had to be canceled or cut back. To date the 2005 Plan's proposed target numbers have been thrown out the window. Some notables in attendence - Bob Bachman, PA TU (far left); FFPA Co-Owner, Dean Druckenmiller (tall dude, back); US Congressman Paul Kanjorski (center); Roy Denmark, ACOE (blue shirt); Dave Arnold, PFBC (maroon jacket). For the record it was the PA TU, FFPA and LRSA guys who were looking out for the TROUT in the lower River!!! All of this is a work in progress and this year has been a great learning experience. Now is the time to get involved!!!!! The voice of the trout needs your support!! Email us for more information.